Today, the streets are filled with little monsters, werewolves, vampires and comic book superheroes who are roaming around freely. It’s the night of Halloween, a name that comes from the contraction of the expression All Hallows’ Eve. Its modern name hides the true origin of the celebration, which more than two thousand years ago had a spooky and phantasmagorical significance, and a close relationship to astronomy. It is believed that this tradition came to the United States through Irish immigrants who told stories like that of the jack-o’-lantern (the origin of the famous illuminated pumpkins), and over time all the mythology has become a global phenomenon. It is based on the celebration of the Celtic New Year, a festival known as Samaín, observed between the years 1200 and 400 B.C. At that time, the Celts believed that on nights around October 31, the gates to the Otherworld were opened, allowing spirits, ghosts and demons to pass over to the side of the living. The Celts lived in the Iron Age—without clocks or calendars—when measuring the passage of time was an astronomical task. They followed the seasons with a lunar system that, instead of counting days, counted the full moons during the year. The lunar month (the period between two full moons) is 29.5 days and the Celtic year had 12 moons (months) with names related to the corresponding seasons: our January was called Riuros (frost), while August was Edrini (burn or fire). But if we count 12 lunar months, we don’t have an exact multiple of 365 days; instead, we obtain a year of 12 x 29.5 = 354 days—meaning that each year the Celtic months would fall behind by 11 days compared to the seasons. In just 15 years, Riuros (frost) would fall in summer, so that name would not make sense. To avoid this discrepancy, the Celts introduced an additional month every 2.5 years; our current calendar, the Gregorian, follows the seasons better, but still has to introduce an additional day in February every 4 years for the same purpose. In any case, the Celtic system was good enough to identify precisely when it was the night of our current Halloween, many centuries before the assistance of technology and with a method as simple as counting full moons. The last month of the Celtic year (Cantlos, meaning song-time) coincided with the full moon closest to the midpoint between the autumn equinox and the winter solstice. This point is known as the passage of the quarter and gave way to the first month of the following year (Samonios, meaning seed-fall) by the festival of Samaín. The Celts lived in Europe, in a middle latitude of the northern hemisphere, which means that during this time of year the length of the days were rapidly decreasing and the nights were lasting more and more hours (just as they do now). Each day that passed, the night lasted three minutes longer; while that may seem insignificant, it means that in forty days the Sun rises an hour later and sets an hour earlier. Nowadays, these changes are not vital, but in an agricultural society without electricity, they were undoubtedly important. It may seem like a primitive choice to place the beginning of the year at that time, but it is neither more nor less logical than our current calendar. Nowadays, the Christmas holidays give way to the new year and these festivals come from the pagan astronomical celebration of the winter solstice, which produces the longest night of the year and the shortest day. Most traditional celebrations have something astronomical behind them. Surely other events that occur on the night of Samaín also caught the attention of the Celts. During this night, the star cluster of the Pleiadesor M45 passes through the highest point of the sky at midnight, a sight that is certainly spectacular and easily visible to the naked eye as a small group of stars in the constellation of Taurus. With the arrival of the cold, there also appear very colourful meteorological phenomena. One of the most striking is a lunar halo, which occurs when there are clouds of ice in the upper layers of the atmosphere that refract the light of the Moon. They can easily be seen as a spectacular iridescent ring around the Moon. The most usual is to see a single halo, the one of 22 degrees, but sometimes two concentric ones can be spotted. It’s not possible to predict when a halo will appear, which made them even more mysterious to our ancestors. 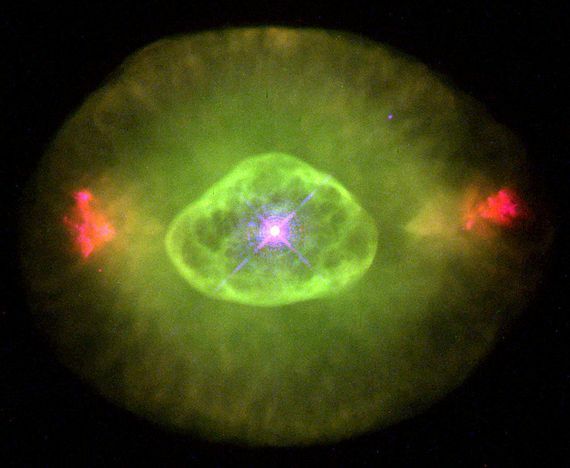 Some objects seem to be haunted, like the “Blinking Nebula” or NGC 6826. 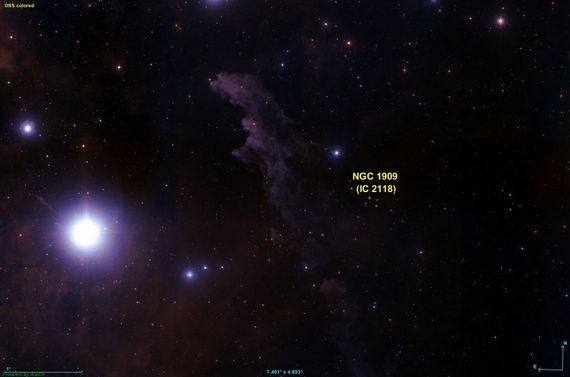 If after locating it with a telescope in the constellation of Cygnus, we observe the outer edge, we will see a star in the centre of the cloud. But if we look towards the centre it disappears, as if it were a blinking eye. Another object, known as the “Witch Head Nebula” NGC 1909, in the constellation of Eridanus, clearly shows the profile of the creepiest witch that can traverse the night sky. 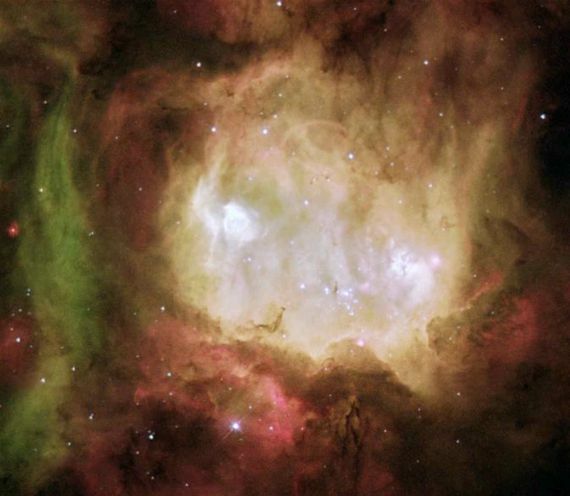 Then we can point the telescope at the constellation of Cassiopeia to see the star cluster NGC 457, also called the “ET Cluster” because of its similarity to the likeable alien who learned about the terrestrial celebration of Halloween during his stay in the movie world of the 1980s. 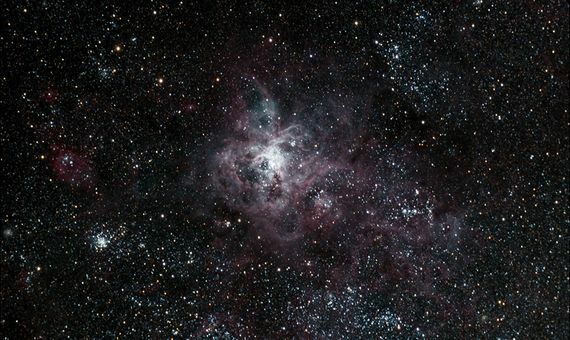 In the Large Magellanic Cloud, observers from the southern hemisphere can find the “Ghost Head Nebula“, or NGC 2080, with a startling appearance, and the “Tarantula Nebula”, or NGC 2070, with its unmistakable giant spider shape. On this Halloween night, many will disguise themselves as ghosts to welcome the season of darkness—literally the longest and darkest nights of the year. From our perspective, we recommend another option: disguising oneself as an astronomer. Halloween needs more Galileos, Keplers and Stephen Hawkings knocking on doors and asking for sweets, to remind us that for most of the history of humanity, we observed the sky and marked the celebration days based on the movements of the stars. These days, unfortunately, we look at the sky less and less because city lights are stealing the stars from us. What Were the First Animals on Earth?